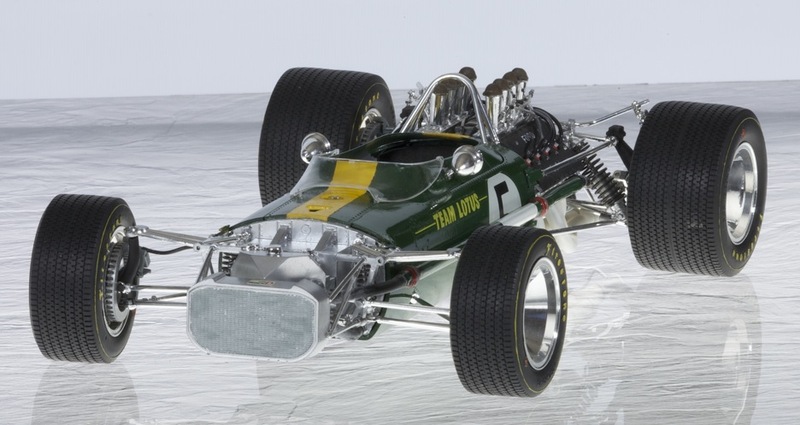 This model built in 1992 represents that driven by Jim Clark (49/R2) at the Dutch Grand Prix, at Zandvoort. 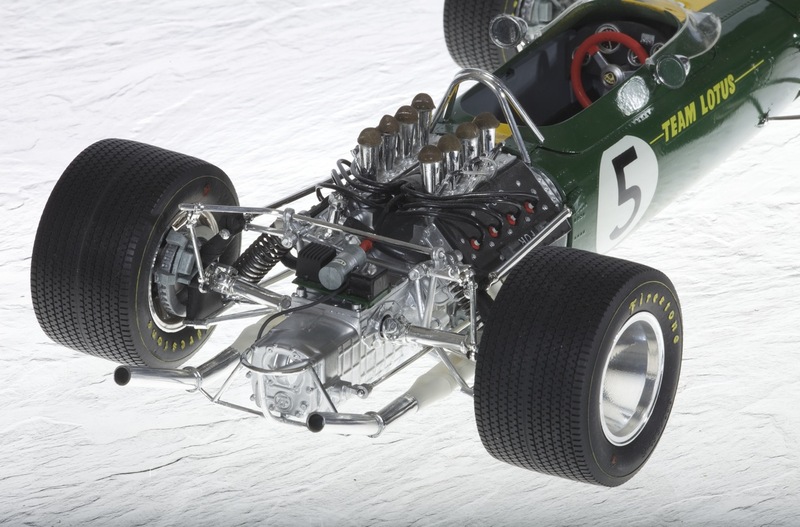 This was the race chosen to debut the new Lotus 49 with its brand new Cosworth DFV engine, Ford-badged in recognition of the development costs put up by the American company. The car ran well in practice in spite of Jim Clark’s absence in the pre-race testing period undertaken by Graham Hill, the latter resident in the UK, whilst Clark for tax reasons was obliged to live elsewhere for a part of each year. Hill therefore placed the car on pole, immediately signalling intent and potential of the new car, whilst Clark managed 8th in practice in a car he hadn’t previously driven. In the race, Hill led until timing gears within the DFV engine failed and Clark made his way up through the field to take the lead and win with fastest lap. Thereafter, throughout 1967 the Lotus 49 showed great potential and Clark won three further Grands Prix, retirements were also common, especially for Hill who was either unlucky or considered to be less mechanically sympathetic. Nine pole positions were secured including three for Hill and a one-two finish in the US Grand Prix won by Clark. The car underwent significant strengthening modifications during 1967 as weaknesses became apparent in the monocoque, suspension mountings and ZF gearbox sideplate integrity. Nonetheless, a great first year and enormous promise for 1968. At the time I acquired this model, it was a rare piece to find and reasonably high prices were common. Since then, re-issues have come on to the market from time to time and also Studio 27 decals as well. I built mine from the box essentially with some Humbrol spray paints and very little was modified, as I recall. Having eliminated Tamiya’s battery box ahead of the seat, I made it quite well and as good as I could, using as little glue as possible and this shows today, for many parts are now loose and it is in need of a little work. 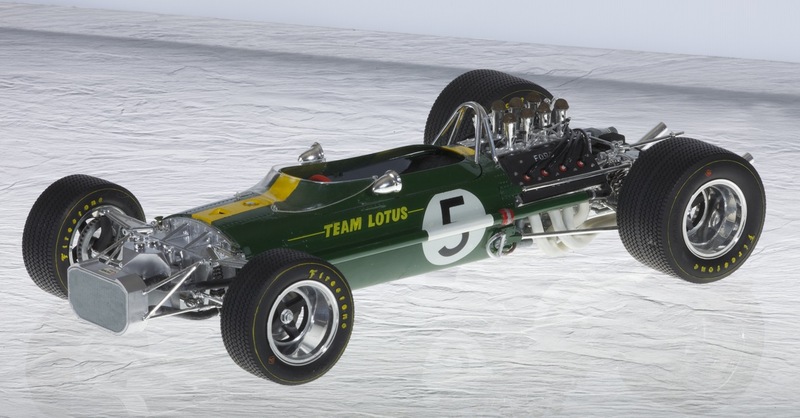 I am reluctant to tackle this job as yet, for having produced 49/R1 from a few parts from the spares box, I now know there are vast areas of Tamiya’s Lotus 49 that would require scratchbuilding. Having said that, a properly done Lotus 49 in the original green paintwork would be a delight, especially of the Zandvoort winning car. If/when I undertake this work, I will want to make sure it conforms to the known monocoque characteristics of R2 and have an uprated, early ZF gearbox, rather than that which is supplied in the kit. 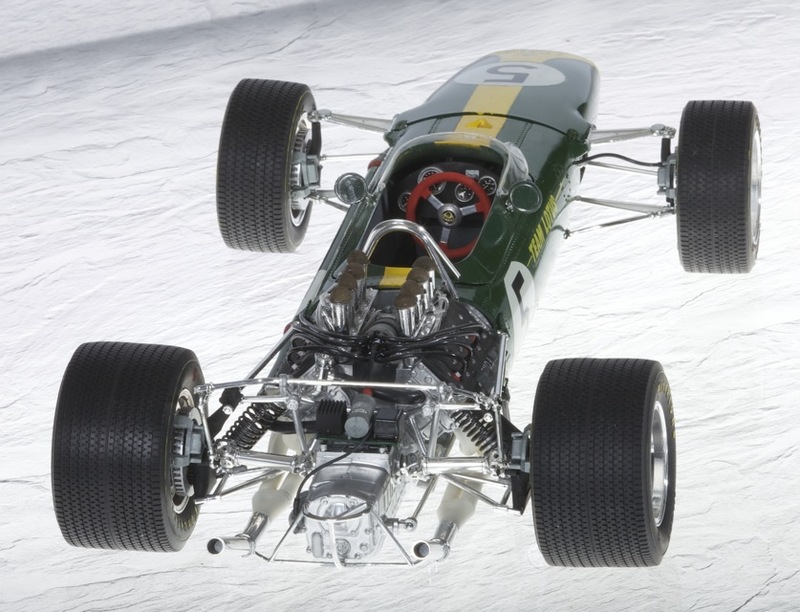 The engine would have to be replaced and much of the monocoque too; therefore only the wheels, tyres and steering wheel with most of the nosecone would survive the radicle surgery, as I experienced with my first serious approach to a Lotus 49, that is 49/R1 (see elsewhere). This particular box-model was improved with addition of fuel pump plumbing, hose clips, electric wiring to the starter motor and wire mesh carburettor trumpet covers, enough to set-it up as being a little special. 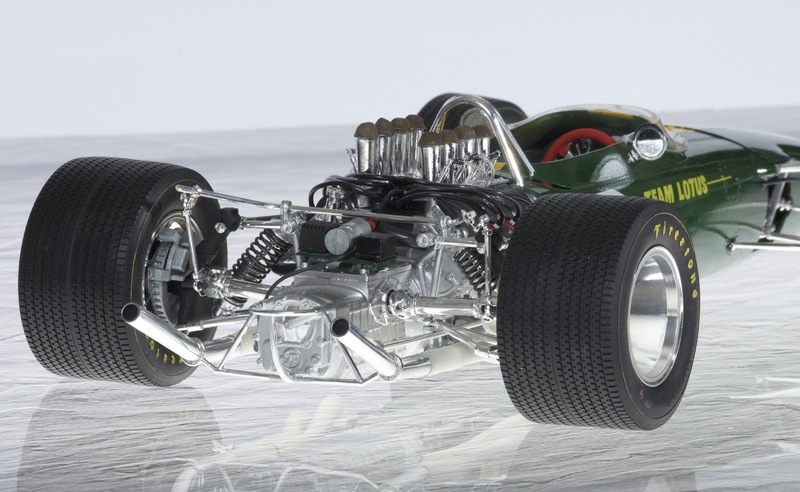 However, I have seen much better models of this car built (admittedly from the box) and would love to examine one of Andy Mathews Lotus 49’s, for even though this would have been an early work of Andy’s, showing a re-cast but over-simplistic gearbox, the general presentation and attention to detail is second to none. 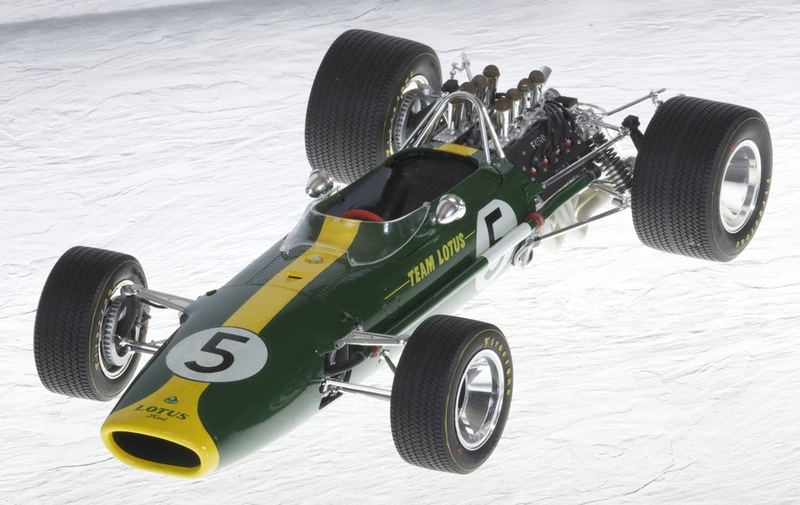 Access to R3 at Beaulieu and seeing R4 at historic events around the country enables more accurate understanding of how the car was put together (see Lotus 49/R1 for details). Helpful books now available and since 1992 when I built this model, include Michael Oliver’s Lotus 49, the story of a legend. 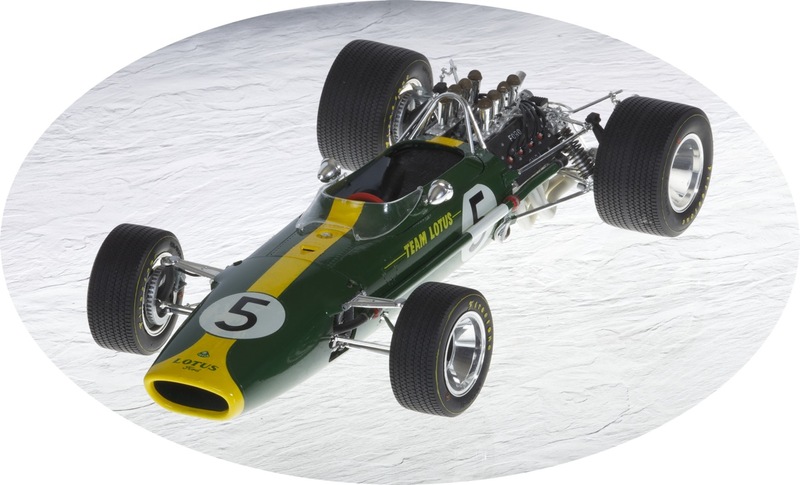 Such books have opened up a considerable understanding of this car; where before in 1992, I like most model makers perhaps, thought that the kit was an accurate reflection of how the Lotus 49 was constructed. In fact, this kit in particular in common with all the early Tamiya models, is a very simplified and quite inaccurate model, especially when the gearbox/engine were so shaped as to accomodate an electric motor and small geared drive section, batteries being housed within the monocoque making for very compromised inner monocoque appearance. I have quite a collection of unwanted Tamiya electric motors and gears!